Questions: MEDICAL EVACUATION(01m21s); HAKEEM/THAILAND (19m42s); FRANKING CREDITS (22m39s); LIBERAL DEBACLE (35m52s); WHY NO ARRESTS? (46m23s); POKER MACHINES (55m01s). 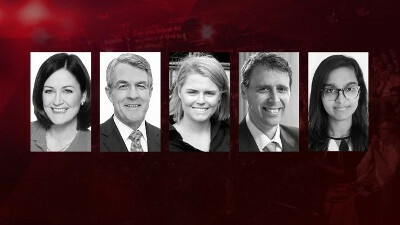 Panelists: Sarah Henderson, Liberal Member for Corangamite, Mark Dreyfus, Shadow Attorney-General, Stephen Mayne, Shareholder activist, Megan Purcell, Businesswoman , Zoya Patel, People's Panellist Audience: Coalition 36%, ALP 32%, Greens 8%, Undecided 18%; Independent 2%; Other 5%.